Pork roast is great option for dinner, especially on chilly winter evenings. 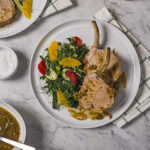 Marinated overnight in a fresh sage, thyme and coriander herb brine, then seared and slow-cooked to perfection in the Wolf Gourmet Multi-Function Cooker, this delicious rib roast accompanied by a hearty kale salad is sure to please your dinner guests. 1. Make the brine: In a large bowl, stir together apple cider, salt, brown sugar, sage, peppercorns, coriander, mustard seeds, thyme and bay leaves. 2. 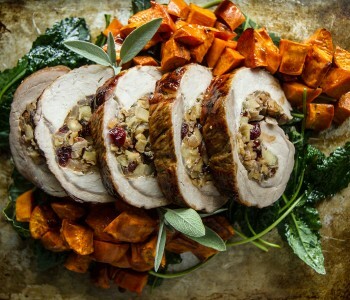 Make the pork roast: Add pork roast to the brine and refrigerate overnight. Remove pork roast from the brine and pat dry. Discard brine. 3. Set the Multi-Function Cooker to Sauté/Sear Mode, HIGH and press Start. Add oil. Cook pork roast until browned on all sides, 6 to 7 minutes. Set pork roast bone side up and sprinkle with sage. Pour wine in the Multi-Function Cooker. Add shallot and garlic. 4. 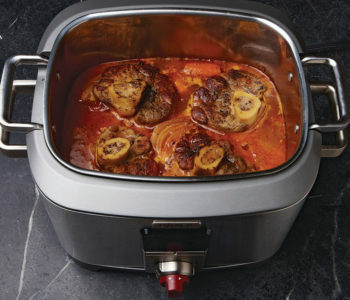 Set the Multi-Function Cooker to Slow Cook Program One, MEDIUM. Insert the probe in the thickest portion of the pork roast, avoiding the bone. Set the probe temperature to 145°F (63°C). Press Start and cover. 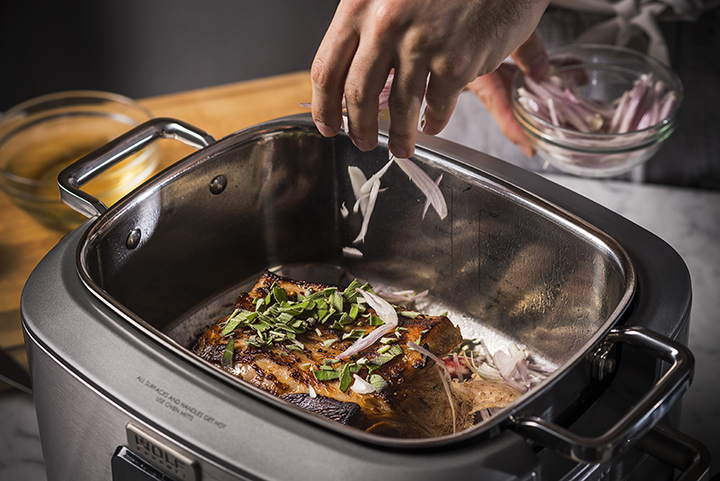 When pork reaches 145°F (63°C), remove from the Multi-Function Cooker. Let rest for 10-15 minutes before serving. Make as directed above, omitting brine and sage. After searing, season with salt and pepper, and rub 1 tablespoon (2 grams) grated fresh orange zest on pork. Increase white wine to 1½ cups (355 milliliters). Add 3½ cups (350 grams) thinly sliced fennel and 3 tablespoons (6 grams) chopped fresh rosemary with shallot and garlic. Cook as directed.